As you know, I love language and I love history. 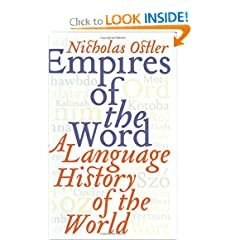 So what would I think of a book that is not just a history of language but a language history–ie, world history as told from the point of view of its various languages? I would love it, of course. The book is Empires of the Word: A Language History of the World, by Nicholas Ostler. I will not try to summarize 559 pages, but do let me try to get you to think: What would you say determines which languages spread and which die out? My point here is simply that history and language are far from obvious and thus infinitely mysterious and fascinating. Unravelling the reasons for the rise and fall of the various languages is a great way to understand, really understand, history. At last an easy and memorable explanation of the difference between pidgin and creole: When adults meet and do not share a language, they will communicate in pidgin; when their children turn this into a new language, it becomes creole. Nicholas Ostler’s book looks of great interest, and I’ll put it on my “to read” list. In your piece you gave examples of languages spread by conquest, and those not. In that connection, I recommend to you an iconoclastic and idiosyncratic little book, called “The History of Britain Revealed – The shocking truth about the English language”, in which the author, MJ Harper, says, in so many words, that languages of conquerors only spread when they (the conquerors) engage in ethnic cleansing, or extermination, or if the conquered peoples are wiped out through disease. Absent this, the languages of the conquered peoples survive, because languages are, demonstrably, extremely tenacious. In the matter of the English language, it was always spoken in England, and so didn’t develop from the language of the Anglo-Saxon invaders, because there is no evidence that the Anglo-Saxons engaged in ethnic cleansing. As to Italian, French, Spanish, and Portuguese, they have more in common with each other than the Latin from which they’re allegedly derived. Thus, Latin was not likely the language of their origin, but simply a written shorthand to enable the diverse peoples of the Roman Empire to communicate with each other in matters of importance. The book knocked my socks off, and might knock yours off too. Good tip (but controversial thesis). And in that vein, let’s also mention David Crystal’s The Stories of English.